In addition to the great line up of three international speakers who will be presenting at the SchoolNet SA conference, we are just as excited to be showcasing extraordinary South African teachers, and their projects and experiences of using technology in the classroom. Sariejtie Musgrave of HigherEdPartnersSA in conjunction with the University of the Free State will be presenting the keynote presentation entitled “Anywhere, anytime learning from the perspective of the learner and the teacher as a lifelong learner” at the SchoolNet SA conference on Friday 6 October. 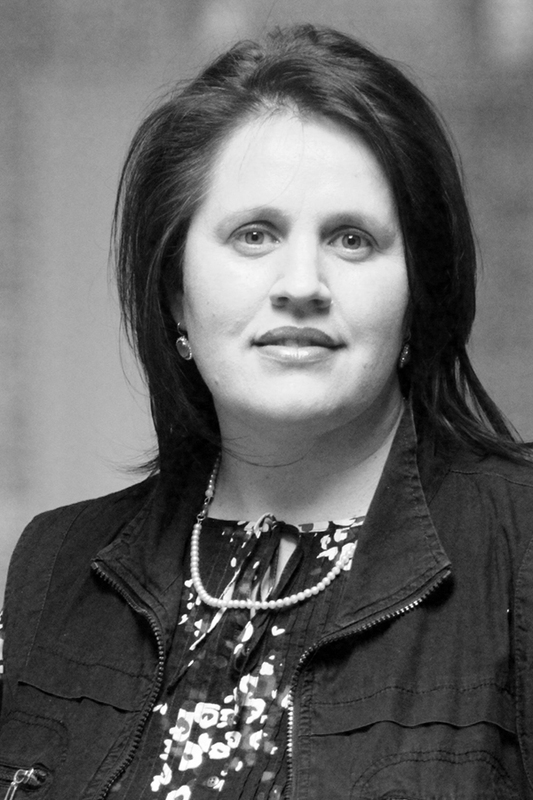 In her previous role as director of the IDEAS Lab, Sarietjie worked closely with various departments of the University of the Free State in the design, development and evaluation of new digital learning initiatives that unlock engaged, personalised and lifelong learning. Having recently moved to Higher Ed Partners SA, Sarietjie will assist in the expansion of their on-line learning capability by making top quality higher education more affordable and accessible. As a former teacher, facilitator and materials developer, Sariejtie has had a long association with SchoolNet SA. She was one of the original Intel Teach trainers, she was recognized for her innovative uses of technology in the classroom as a Pan-African and Worldwide Microsoft Innovative Teacher Award winner, and she hosted the SchoolNet SA conferences in Grey College and at the University of Free State. We look forward to hearing more about Sarietjie’s experiences of being a lifelong learner and teacher who is passionate about providing high quality, engaging educational experiences. The SchoolNet SA conference covers a number of themes that focus on digital learning in the Foundation, GET and FET schooling phases. Delegates can expect to attend three days of professional development, hands-on workshops and inspiring keynotes – all of which are all covered in the ticket price, inclusive of teas and lunches and a special birthday celebration event. SchoolNet SA is offering schools, organisations or groups of teachers who would like to attend the conference discounted tickets. For every four tickets you buy at the same time you will get one free – or put another way the five tickets you book at the same time will cost R800 each instead of R1000 per person. This offer is available to schools, educational institutions, or groups of five teachers who book and pay for the tickets at the same time. Please book your tickets online through Quicket and pay by credit card or contact kumari@schoolnet.org.za if you require an invoice. Tickets to attend the SchoolNet SA can still be purchased online through Quicket for R1 000 each (including VAT) – please do get your ticket soon though as the spaces are filling up fast. SchoolNet SA will be offering 10 deserving SchoolNet SA members a free ticket each to attend the SchoolNet SA conference. Please note that this sponsorship will only be for the cost of the conference ticket entry – and you will be required to make and cover the costs of your own travel and accommodation arrangements. If you would like to be considered for one of the 10 sponsored tickets – please fill in THIS FORM with your details and a brief motivation as to why you would like to attend the conference by Friday 8 September 2017. SchoolNet’s Hlengiwe Mfeka had the opportunity to attend a Women’s Breakfast at the Golden Horse Casino in Pietermaritzburg last week. It was a charity fund-raising event organised by the Community Chest and proved to be an inspiring morning. It started with a fun five minute body workout in the form of a dance led by one lady while the audience followed her movements. She gave a brief talk on the importance of moving every day. She made one statement which was memorable, "If you are judgmental to yourself so will people be towards you". 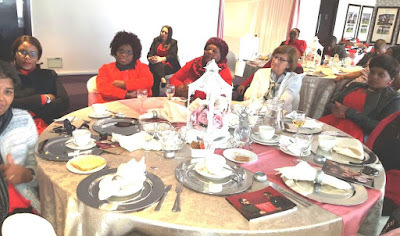 Hlengiwe liked this speaker the most –because she was such a powerful speaker with a strong message. These inspiring feel-good talks were followed by music and dance entertainment. There were then prize draws and fundraising items. Hlengiwe’s take-away from the whole event was that in doing something for another person one finds joy and contentment in oneself. We are pleased to announce that our next free webinar, 'Explore the Chekhov app for online writing'' will be held this coming Thursday 31st August at 3:15pm. Our speaker will be Phuti Ragophala, well-known in many international and local education circles and also a Microsoft MIEExpert Educator from Limpopo. Webinar title: Explore the Chekhov app for online writing. Presenter: Phuti Ragophala ,an online MIEExpert and VTA who changed her scenery of teaching and learning from traditional classroom to online teaching. An ambassador in various educational institutions including Microsoft in Education, Varkey Foundation, Kakuma project in Kenya, Centre for Public Service Innovation ,South African Council of Educators and African Federation of Teachers Regulatory Authority. Summary: Teaching was never an option to me as a career. I grew up looking upon my mother who was a nurse and wanted to follow her footsteps. While still waiting to be called to train as a nurse ,my parents encouraged me to move time by training as a teacher. I trained and completed my teaching and started working as a teacher. More than three decades down the line, the nursing call never came. I am a waiting nurse in the department of education as an online educator where I enjoy each and every moments using education to change the lives of people. Teaching is my passion. One of the many things I love in teaching is using the Chekhov app. Online book writing is not for the academics only. Even children can write books online using Chekhov app. In this webinar I will tell you all about this app. On Saturday morning 27th August we had a most enjoyable GEG gathering at Grove Primary, run by the two central GEG leaders, Peter Schutte and Che Marnwick, both from Wynberg Girls High School. 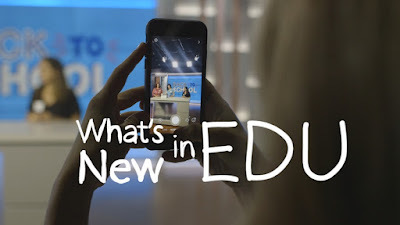 Google Educator Groups (GEGs) are communities of educators who learn, share, and inspire each other to meet the needs of their learners through technology solutions. The groups around the world have local teacher leaders who arrange meetings, such as Peter and Che. After tea and fun at the photobooth we settled down to the fun icebreakers and the presentations of the day. The photos of the day can be seen below. Most of them were posted in the GEG Soputh Africa community by Shelley Schutte. Two of them are ones that I took. 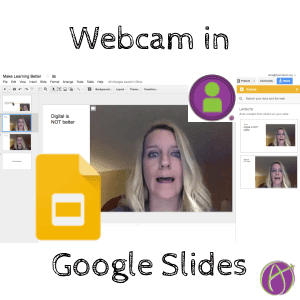 In the previous post, entitled: 'How to add a folder of photos to a Google presentation QUICKLY...using the DriveSlides extension', we indicated how to create a Google presentation of photos, like the one below, in seconds using the extension DriveSlides. Have you ever wanted to add a slideshow of photos as a presentation on Blogger, for example, and there seems to be no quick fix? I have tried several options, unsuccessfully, until I came across this amazing app developed by Matt Miller and Alice Keeler, two of my favourite Edtech bloggers!. It is called DRIVESLIDES. DriveSlides takes an open folder of images in your Google Drive and it creates a new Google Slides presentation in seconds and adds each photo in that folder to its own slide in the presentation. This saves hours of time! I first heard about DriveSlides on an Instagram image created by Tony Vincent, another one of my favourite EdTech bloggers. . This is how i went about installing DriveSlides - in case you want to do so as well. You need to be using the Chrome browser. Open your Chrome browser and in the Apps section look for Chrome webstore. Ask for the extension called DriveSlides. You'll notice that when it is added at the top of your browser it is a grey colour. Once an open folder of images presents itself the icon turns orange! Add this second extension as well as it will facilitate this process of creating a slide presentation from a folder of images. Upload your images and create a folder for them. Open the folder. You'll notice that the DriveSlides extension turns orange once the folder is opened. It will ask for permission the first time you use it. Click on Allow. 5. Your slide presentation will appear! In a matter of seconds your slide presentation will appear. It's amazing! All that's left now is for you to embed the presentation into your website, blogpost or Google Site! Thank you to Matt Miller for creating such an awesome time-saving extension! Matt Miller has written about the is extension and how you can use it your classroom in his blogpost entitled: 2 BRAND NEW tools to help students display work, reflect. 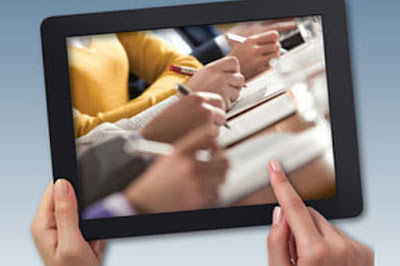 His video tutorial on how to create a DriveSlides presentation is embedded below. Hey everyone it's time for another exciting GEG Event (Cape Town Central), happening on Sat 26th August from 9 -11 at Grove Primary School. Please feel free to share this invite! This is an informal event where you can connect with teachers from other schools to share. Should you have any friends at other schools that you would like to invite please do! We are so looking forward to having Stephen Reid at the SchoolNet SA conference taking place at Brescia House School on 5 – 7 October 2017. Stephen will be doing a keynote about “Emerging Technology in Education” If you haven’t booked your spot yet, be sure to register HERE, -http://www.schoolnet.org.za/conference2017/, by the end of August to secure the early bird rate. If you are a Minecraft: Education Edition fan you’ll definitely want to attend some of Stephen’s sessions. He is the Minecraft Guru from Scotland who presents on Minecraft: Education Edition all over the world. 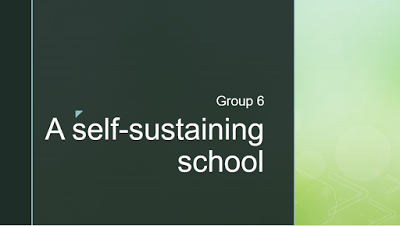 Across the three day conference, Stephen will also be offering a number of breakaway sessions including the Problem-Based Learning Course which encourages students to think more critically and to work collaboratively through being faced with solving ill-structured, open-ended, messy problems. 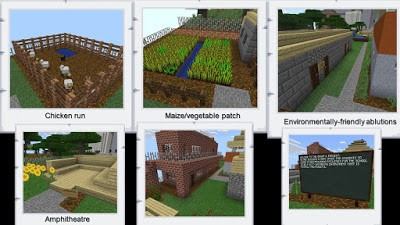 Minecraft novices and experts will also have opportunities to explore Minecraft: Education Edition and the “Small South Africa” world which Stephen created for use by teachers and learners who want to build solutions in Minecraft that relate to a South African context. 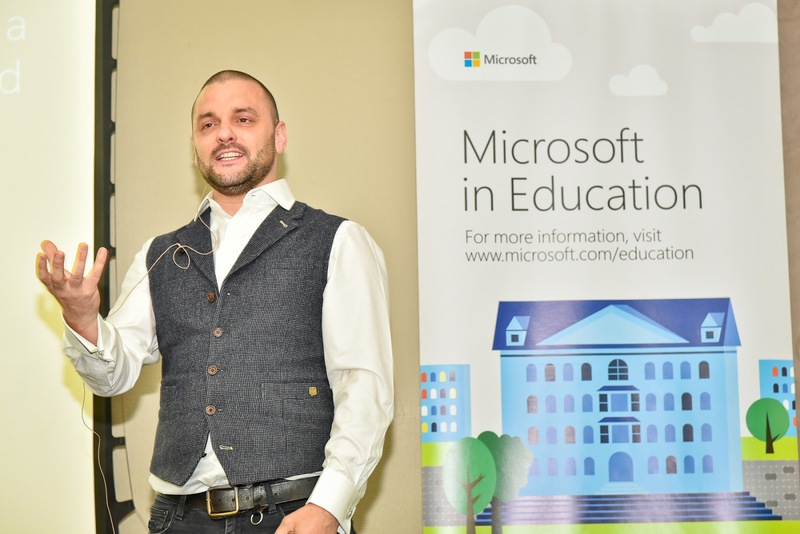 Recently at the E2 Conference for Microsoft’s MIEExpert Educators in South Africa Stephen presented sessions on problem-based learning. 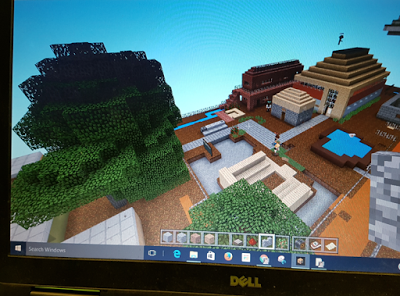 The #MIEExpert Educators and the other invited guests completed a problem-based learning activity in groups using Minecraft: Education Edition as a tool to demonstrate how they would solve the problem they had identified. This was a great learning experience. Let's take a look at how one of the groups experienced problem-based learning under Stephen's guidance. Problem-based learning is a great way for everybody in the group to learn together. 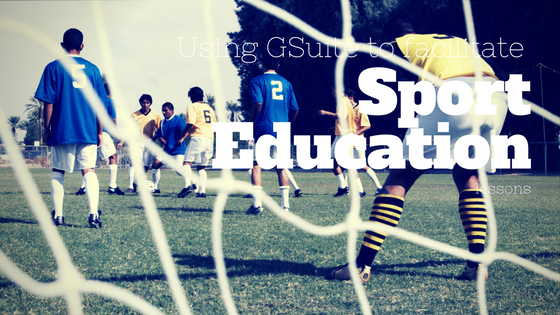 It facilitates active learning, critical thinking, collaboration, and creativity. Dr Preetha Ram says “Problem-based learning enables students to embrace complexity and joy in their learning, and enhance their capacity to make creative contributions to real-world problems." Learners in groups come up with a problem you have observed in the real world and they work on creating solutions for this problem. At the E2 the groups used Minecraft: Education Edition to demonstrate their solution. 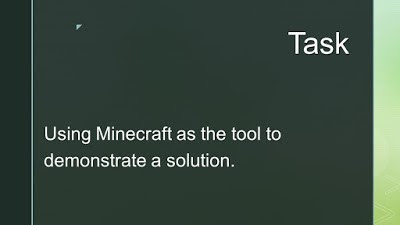 This was the task at the E2: "Come up with a problem you have observed in South Africa and demonstrate how you will solve this, using Minecraft: Education Edition. Present your solution on a Sway or as an Office Mix." a) A shared online OneNote notebook to work on. 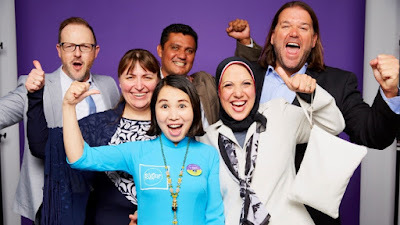 OneNote is very suited to problem-based learning as you can share content, images, videos etc very easily if you have a good Internet connection. 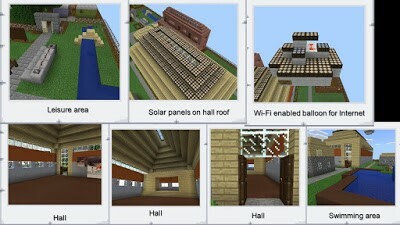 b) Then there was Minecraft: Education Edition which they used to demonstrate their solution. A Minecraft world had already been created for the E2 by Steven Reid. c) The final product was to be presented on a Sway or an Office Mix. As a group they brainstormed problems in South Africa. Of course there were many! 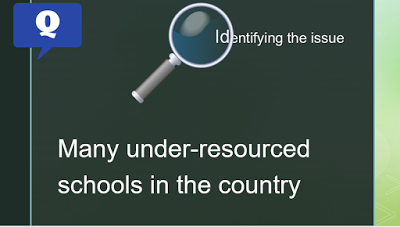 They then narrowed it down to three and eventually voted for one - under-resourced schools in the country. The next step was to create the driving question related to their enquiry. 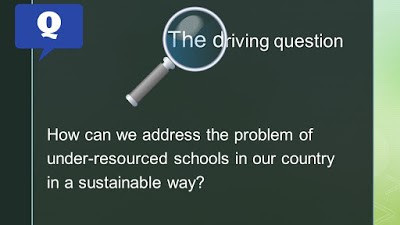 A driving question is one that captures the heart of the project by providing the purpose of the enquiry and by using clear and compelling language. The question should drive the participants to discuss, inquire, and investigate the topic. This step involved brainstorming what they would include in their under-resourced school to provide the needed resources. 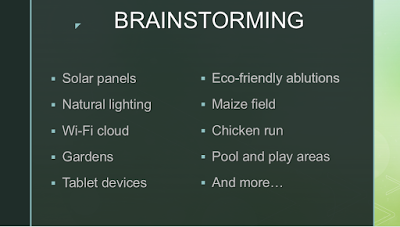 Here are some of the ideas they came up with and discussed these at length. Now it came to the part of building using Minecraft; Education Edition to demonstrate their solution. Steven had taught the E2 delegates some of the basics so that they knew how to move around their Minecraft world. Each group could only see their group’s work and each group member appeared as little characters in the Minecraft world. So the group could see what each one in the group was doing at any stage. The group divided up the solutions they had thought of, and each one in the group built theirs. They had to take screenshots of the different objects that they built as proof of their solutions. The group then created a video of what they had done using Minecraft: Education Edition and one of the members embedded this video into the group PowerPoint. Here is their video. The important thing when you present solutions in problem-based learning is to have some relevant role players present – even the people who could make this solution happen if that was possible. These people could even be invited in via Skype. So, if you would like to experience something like this and learn from the amazing presenter, Stephen Reid from Ireland, consider registering for the SchoolNet ICT in the Classroom Conference on 5-7 October in Johannesburg http://www.schoolnet.org.za/conference2017/. .
We are thrilled to announce that Ollie Bray from the UK, has been confirmed as a keynote speaker for the SchoolNet SA conference. Ollie's career in education spans over twenty years. During this time he has been a teacher, head of department, senior government adviser and school leader. In recent years this has included a four year secondment to the Scottish Government as their National Adviser on Emerging Technologies for Learning. 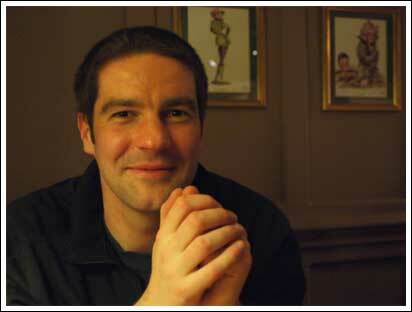 He is currently Headteacher at Kingussie High School located within the Cairngorms National Park. He is also a Member of the Board of Management at Inverness College: University of the Highlands and Islands as well as well as serving on several other advisory boards including the BBC’s Educational Broadcasting Council for Scotland. Under Ollie's leadership Kingussie has been rated one of the most improved schools in Scotland. At a systems level, most recently, he has been responsible for co-designing the deployment of 22,000 Chromebooks across his education district. 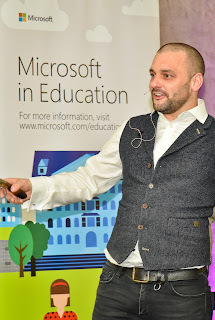 For over a decade Ollie has worked regularly in schools and school systems around the world advising about whole school improvement, technology for learning and learning space design (both digital and physical). When he is not working he enjoys riding his bike (very long distances), paddling his canoe and wandering in the mountains. In his keynote Ollie will reflect on new trends in learning, teaching and school leadership and talk about how technology can improve outcomes for children and young people by transforming the learning landscape. Register here, on our Conference page, for the SchoolNet SA conference – taking place at Brescia House School in Bryanston, Gauteng between 5-7 October 2017. If you register before 31st August you qill qualify for the early bird rate. Canva (canva.com) is a graphic-design tool website which has both free and paid elements. It is web-based and is available for iPads and Chromebooks. You can also use it as a Chrome extension when using the Chrome browser. After spending some time exploring Canva I found that it has an easy to use drag-and-drop interface and provides access to over a million photographs, graphics, and fonts. There are free and paid elements but I found there are sufficient free elements for one to use the program very creatively. When you explore Canva for the first time a feeling of great delight comes over you! You suddenly realise that Canva could be great to use in the classroom for various design projects. There are so many useful free Canva tools available. In this post I will give you some classroom ideas. 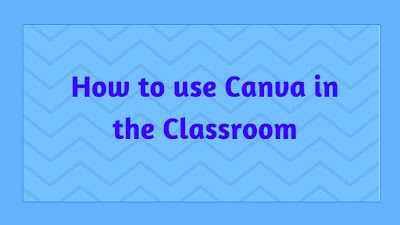 As I looked around Canva I found so many ways I could bring it in to my teaching. You can create professional presentations, posters, multi-page documents, invitations and cards, infographics and so much more. There are just so many different templates. How do you access Canva? 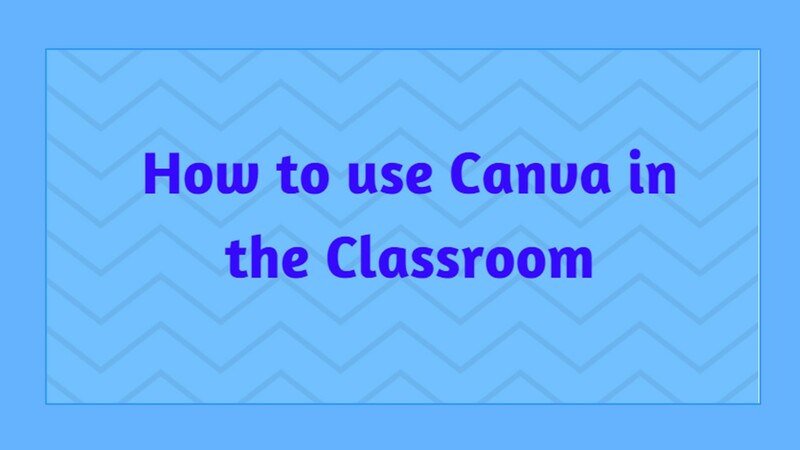 But first, how do you access Canva in the classroom? The process is simple. Select one of the over fifty-six categories shown above such as presentations, posters,greeting cards, infographics, cover pages and more.. Replace the text and images. Optionally change colors, size, layering, and more. Alternatively create your own project with a blank template. My students signed in with their G Suite accounts. Recently I read in a blog post that you have to be 13 or older, but we never saw any restrictions when signing in. Perhaps with my younger students I will create one school account for the class and let them all sign in to that. Students love to create cards for their family and friends. They could create and download attractively designed cards using Canva. How Can I Use Poster-Making to Facilitate Learning in the Classroom? Students often need to compile reports for various subjects and Canva is great to use for this task. For ideas on how to do this read: How to Design Your Report for School Projects With Canva's Free Alternative to Photoshop. If your students have written their reports or e-books using another program, they could then design the cover for their project using Canva..
1. I used Holly Clark’s ‘Think-Pic-Share idea recently in several ways. This makes use of the Twitter template and one can use it for summarising. One class used it to write about their favourite book since it is book Week at school. Another class used it to summarise what they had learned in a History lesson. 2. Our Grade 7s are busy with a ‘Flour Baby’ project in Life Orientation. We are using Canva to create a Stork party invitation, thank you cards, a baby announcement and a final report on the project. The Grade 7s love using Canva. If you haven't already tried using Canva, give it a go. You'll love using this program! We are thrilled to announce that Peter Rafferty from the UK, has been confirmed as a keynote speaker for the SchoolNet SA conference. Up until 2016 Peter Rafferty was a primary school teacher and digital leader at Green Park Primary School just outside Liverpool in the UK. As well as being a successful and enthusiastic teacher, he was at forefront of educational blogging in the UK starting the www.greenparkschool.org.uk blog in 2005. This early adoption of technologies to support teaching and learning continued with the introduction of G Suite (then Google Apps for Education) in 2010. With a strong background educational digital strategy, Peter moved from being a full time teacher to teaching part time as well as using his skills and experience to work with schools and teachers in the UK and across Europe. He still supports Green Park on their technology adventures as well as Redgate Primary School in Formby. The continuing and infectious enthusiasm for technology and digital skills to be at the heart of teaching and learning have helped Peter to have a creative and innovative network in many different regions of the world. Register here, on our Conference page, for the SchoolNet SA conference – taking place at Brescia House School in Bryanston, Gauteng between 5-7 October 2017. 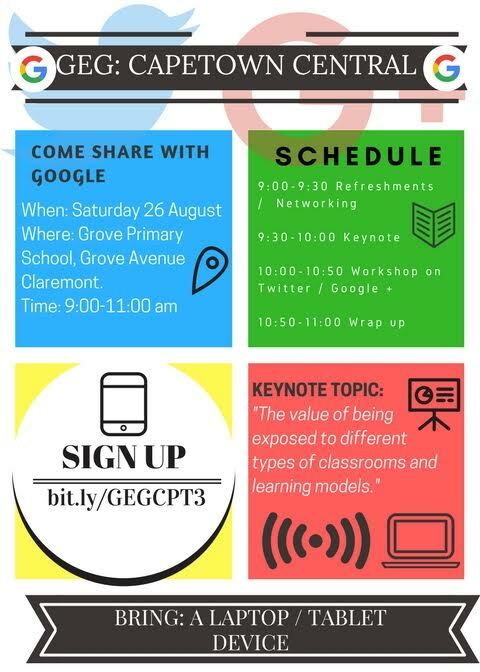 The SchoolNet SA ICT in the Classroom conference is just over two months away. If you have not registered yet, please do so as soon as possible to get the discounted price. Delegates who register before 31 August 2017 will pay R1 000 per person including VAT. Registrations from 1 September 2017 will be at a rate of R1 140 per person including VAT. Presenters, whose speaker proposals are accepted for the conference, will have their conference fee waived. So if you would like to apply to present a session at the conference, please do so as soon as possible as we will be finalising the program by the end of August 2017. Don’t delay - register or apply to be a presenter for the SchoolNet SA ICT in the Classroom Conference here. We are thrilled to announce that Stephen Reid, director and creative genius of Immersive Minds has been confirmed as a keynote speaker for the SchoolNet SA conference. Stephen ​will be presenting the keynote address entitled “Emerging Technology in Education” at the conference opening on 5 October 2017. 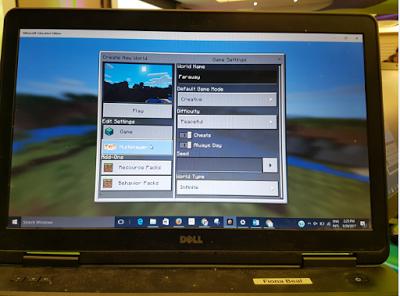 This session will explore how teachers can use a range of tools including Minecraft: Education Edition, Sketchfab, TinkerCAD, 3DPrinting, VR, 360 cameras, OneNote, 3D Paint and more in creative and engaging ways. Across the three day conference, Stephen will also be offering a number of breakaway sessions including the Problem-Based Learning Course which encourages students to think more critically and to work collaboratively through being faced with solving ill-structured, open-ended, messy problems. 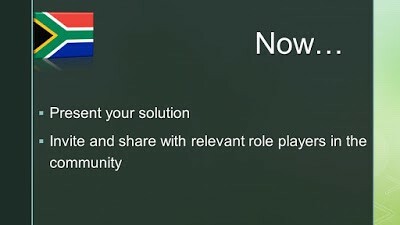 Minecraft novices and experts will also have opportunities to explore Minecraft: Education Edition and the “Small South Africa” world which Stephen created for use by teachers and learners who want to build solutions in Minecraft that relate to a South African context. Stephen is the Mind behind Immersive Minds. 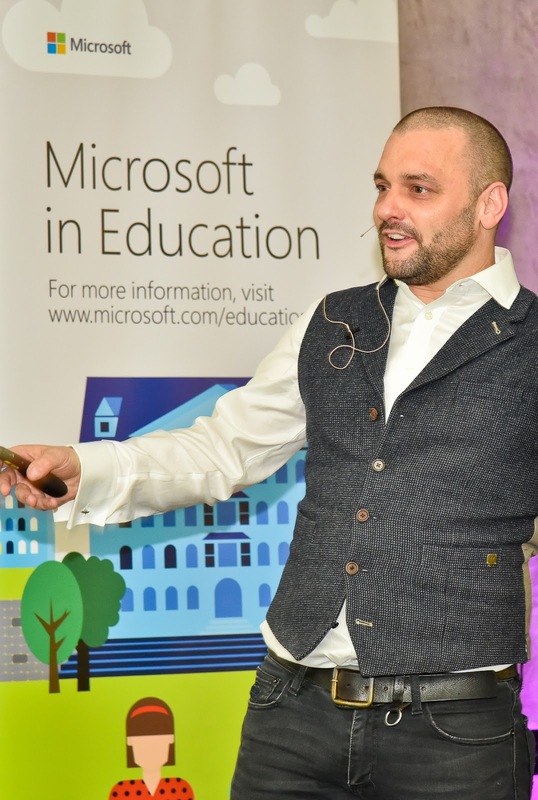 He has been pioneering the use of technology as a tool for learning for almost twenty years, and has dedicated his career to exploring, piloting and advocating its use in schools around the world. He leads the Immersive Minds team of educators, coders and builders in creating innovative, transformative learning experiences and resources. Teachers who attended the Minecraft: Education Edition launch in Johannesburg or Cape Town, or the E2 Africa Forum for Microsoft Innovative Educator Experts can attest to what an engaging, knowledgeable and insightful presenter Stephen is. We are delighted that he will be able to share his sessions with a wider audience of teachers at the SchoolNet SA conference. Register here for the SchoolNet SA conference – taking place at Brescia House School in Bryanston, Gauteng between 5-7 October 2017.